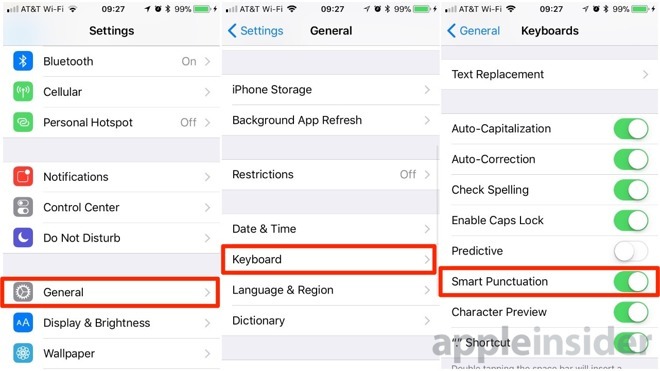 An unexpected side effect of Apple's new Smart Punctuation feature in iOS 11 has manifested and is causing some problems with apps that use Core Data to store strings. Here's how to turn off Smart Punctuation, and why you might want to for now. In all likelihood, Apple is already working on a fix, and given a brief perusal of developer documentations, it appears to be able to be temporarily disabled by app developers. However, to fix the problem on your personal devices and sidestep the issue for now in its entirety, here's how to turn off the feature.